At the end of September, the two cities that would host the Olympic Games in 2024 and 2028 were revealed: Los Angeles will host the games in 2028, and Paris will host them in 2024. A chance to review the incredible institution that is the Olympic Games and to look back on the years when Paris was the host city. The modern Olympics: a French invention? A major international event, the Olympic games take place every two years and are held alternately in the summer and winter. Obviously, the events differ: historically focused on athleticism and team sports in the summer, and on skiing, skating and ice sports in the winter. Pierre de Coubertin. 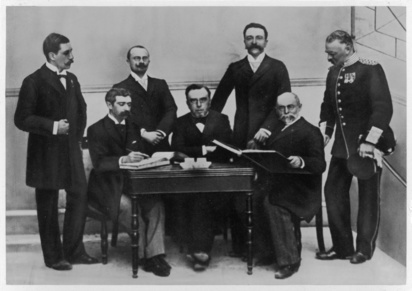 He founded the International Olympic Committee, which he presided over from 1896 to 1925. The first games took place in 1896 in Athens: a return to its roots for the first modern summer games. 241 athletes from 14 nations took part. The large European nations were featured: Greece, Germany, France and Great Britain. The first winter games took place in 1924 in Chamonix. Since then, the games have taken place every four years, the even years, in a different country, alternating between the summer and winter games. The candidate process is very long, starting 10 years ahead of the games. Made up of 3 steps, it takes 3 years to conclude. This means that each host country is decided 7 years before the year the games will take place. Ten years beforehand, the IOC (International Olympic Committee) invites the National Olympic Committees to declare their interest in hosting the Olympic games. For 3 years, everything is under scrutiny: the vision, the design and the strategy, as well as legal and financial aspects, and experience, in terms of past Olympic games. Following this, the evaluation commission of the IOC visits each candidate city. After an informational meeting to present their evaluation report, the members of the IOC elect the host city. The application process must present how the games will be organized, in as specific a manner as possible. This covers the location of the Olympic sites as well as the way in which the Olympic spirit will be promoted. Following this schedule, at the end of September the results of the award of the Olympic games for the summer of 2024 and 2028 were revealed. Paris was competing against Los Angeles. This was an historic decision, since, for the first time, it was a double award: the two candidate nations would be rewarded for their efforts: Paris in 2024 and Los Angeles in 2028. Paris has a valuable asset: most of the sites and facilities where the games would take place already exist. For the others, temporary locations will be set up. The organizers want to promote the games in an environmentally responsible way, and to help the city to grow in a positive manner. This is the reason that some facilities, such as the athletes village, will be built in Saint Denis. 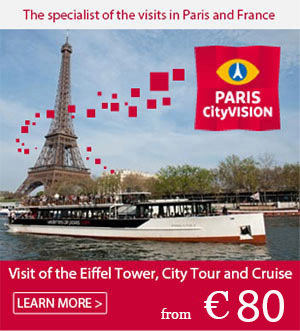 This will promote the long term development of this area and lead to a greater role in the vibrant city that Paris is. The first Olympic Games in Paris took place in 1900. At the time there were 24 nations, represented by 997 athletes, that came to the capital to compete in the sporting events for a month. During these Olympic games, women competed for the first time, at the croquet games. Nineteen kinds of games, including cricket and croquet (which were not in the summer games of 1928) were presented. The second Olympic games in Paris took place in 1924. This year really demonstrated the magnitude that the Olympic games had taken on, since they went from 29 to 44 countries, and from 997 to 3,088 athletes. It was during these games that the first closing ceremony as we now know it took place: tremendous festivities and the parade of athletes. The Olympic games of 1924 were the subject of a film, “The Chariots of Fire”. Since then, the Olympic games have grown even further; the most recent summer games in Rio in 2016 brought together 207 countries and no less than 11,238 athletes for 22 sports played. The next winter Olympic games will take place in February, 2018 in Pyeongchang in South Korea. In 2024, that is, one hundred years to the day after the last Parisian games, the games return with their romance of youth. The sites that will host the Olympic games in Paris in 2024 add to the prestige of the event and/or are totally adapted for sporting events of this scope. The Stade de France, which hosted the Football World Cup in 1998, is the perfect setting for the Olympic games. The opening and closing ceremonies, as well as numerous athletic events will take place there. An aquatic center will be built in Saint Denis near the Stade de France for some of the swimming competitions. It supplements the Water Polo center of Marville, which has been renovated for this occasion. The firing range will be erected in Bourget, near the Media Village. Bourget will also host the volley ball games. The prestigious setting of Champ de Mars will offer a choice location for beach volley ball and boccie, a sport that is similar to petanque. An even more symbolic site, the Eiffel Tower will host the free swimming competitions, and the starting line for the triathlon events. The most beautiful avenue in the world, the Champs Elysées will be set up for the cycling events. Can there be a more beautiful finish line than the Arc de Triomphe? 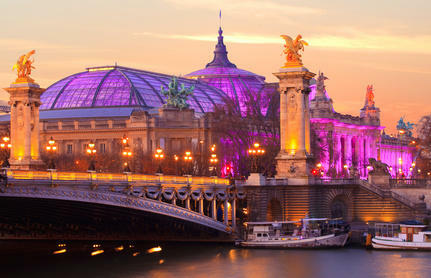 The Grand Palais, built for the World’s Fair of 1900, makes a come back with these major world events. The fencing and taekwondo events will take place there. The Grande Halle de la Villette, the architectural masterpiece of the XIX century, will host the weightlifting competitions. The Esplanade des Invalides, dominated by the majestic Dome, will offer its large area to the archers. Paris Expo, the largest exhibition site in Europe at the Porte de Versailles, will open its doors to the handball competitions and to some of the table tennis events (others will also take place at the Stade Pierre de Coubertin). The largest sports facilities in Paris will be put to use, facilities such as the Parc des Princes, the Stade Jean Bouin, the Stade Yves-du-Manoir and of course the Roland Garros stadium for tennis and several paralympic events. The Zenith, Bercy Arena and Arena 92 in Nanterre la Défense: these large spaces dedicated to entertainment and performances will also ring out with shouting of the athletes and spectators alike. Don’t forget the Château de Versailles, which will host the riders and their horses for several equestrian competitions and part of the pentathlon. Also located outside of the city, the Vélodrome National de Saint-Quentin-en-Yvelines and Elancourt hill will host several sporting events: BMX, track cycling, the pentathlon, mountain biking, etc. The Vaires-sur-Marne watersports base will be used for the rowing and canoe events. The Olympic and Paralympic Village will be set up in the communities of Saint-Denis, Île Saint Denis and Saint Ouen. This eco-neighborhood of 51 hectares will have a long lasting effect on the urban landscape of Paris and will become a living and leisure space. Olympic Games 2024: the regions are featured! All of France is committed to the 2024 Olympic Games. Other cities will host some events. This will also be a great time to visit Marseilles. The Phocean city will be at the forefront for all of the sailing competitions, its harbor offering an exceptional location, one of the most beautiful in the world, for the competitions that show every sign of being unforgettable. The football matches will take place throughout France, in stadiums that have thrilled supporters all year long: the Stade Vélodrome de Marseille, the Stade de Lyon, the Stade Pierre Mauroy de Lille or even the Stade de Nice will vibrate with the rythm of the 2024 Paris Olympic Games.